Pastor Andrew Brunson, left, gestures as his wife, Norine, listens during an interview at the headquarters of Christian Broadcasting Network in Virginia Beach, Va., Oct. 19, 2018. Brunson was recently released from prison in Turkey. While the drama of the disappearance and death of Saudi journalist Jamal Khashoggi at the Saudi consulate in Istanbul played out this month, Turkey made a surprise move and freed, on Oct. 12, American pastor Andrew Brunson, who had been convicted of terrorism-related charges and spent about two years in a Turkish prison before being released. In a recent interview with VOA, conducted since his release, Brunson said there are still several Americans in Turkish custody. He said Turkey views Turkish-American citizens differently from those who hold only American citizenship. “The main difference between my case and theirs is I’m an American citizen but they are dual citizens. They are American and Turkish, and they come from Turkish background. And so, the American government looks at this all the same,” Brunson told VOA. “But the Turkish government looks at dual citizens, a citizen who is also a citizen of Turkey. They say, you are Turk and so the United States should not be intervening or interfering in anyway in this case because you are a Turkish citizen,” Brunson added. There is no official number of U.S citizens imprisoned in Turkey. But Brunson said U.S. Secretary of State Mike Pompeo assured him during a meeting at the State Department recently that the U.S. government is determined to continue to work for the release of other U.S. citizens. Last week, during a visit to Turkey to discuss the disappearance of Khashoggi with Turkish authorities, Pompeo again brought up the issue of the detention of U.S. citizens in Turkey. “The secretary also discussed with Foreign Minister (Mevlut) Cavusoglu the continued wrongful detention of Dr. Serkan Golge and other U.S. citizens as well as locally employed staff from U.S. Mission Turkey,” Heather Nauert, spokesperson for the U.S. State Department, said in a statement released last week. FILE - U.S.-based Turkish cleric Fethullah Gulen at his home in Saylorsburg, Pa., U.S. July 10, 2017. Brunson became a high-profile case in U.S.-Turkey relations and led to a deterioration of relations between the two NATO allies that were already suffering thanks to a host of issues, including Turkey’s crackdown on dissidents and Washington’s relations with Syrian Kurds, who are fighting against the Islamic State but whom Turkey views as a wing of the outlawed Kurdistan Workers’ Party (PKK). Turkey accused Brunson of aiding the PKK, which the U.S. and EU have designated as a terrorist organization, and also accused him of helping U.S.-based Turkish cleric Fethullah Gulen, whom Turkey has accused of being behind the 2016 failed coup attempt in the country. Brunson and the U.S. denied those charges against the American pastor. U.S. imposed sanctions on Turkey’s ministries of interior and justice as part efforts to put pressure on the country to release Brunson. After Brunson’s release, attention shifted to other U.S. citizens and locally hired consular staff in Turkey who have been detained on similar charges and are still imprisoned. Some experts like Howard Eissenstat, a nonresident fellow at the Project on Middle East Democracy, a Washington-based organization, believe that more pressure might be needed on Turkey. “The priority was on Brunson, but my expectation is that unless there is further movement on [the detentions of] U.S. citizens and the consular staff, my suspicion is that there is still a good chance that further sanctions will be forthcoming in 2019,” Eissenstat, who is also a professor at St. Lawrence University, told VOA. But Nate Schenkkan, director of special research at Freedom House, believes that Brunson’s case was an isolated issue that Turkey wanted to use as leverage. “This was a policy of taking hostages in an attempt to gain leverage over allied countries, actually,” Schenkkan told VOA. “I think in actuality the process clearly backfired with Brunson but not only has it been a very shortsighted policy, it hasn’t produced the effects that Turkey’s government hoped it would. In fact, what it has really done is outrage not only politicians but also the publics in allied countries,” he added. 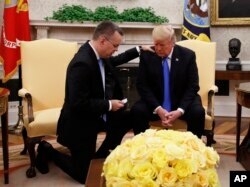 FILE - President Donald Trump prays with American Pastor Andrew Brunson in the Oval Office of the White House, Oct. 13, 2018, in Washington. Brunson returned to the U.S. after he was freed Friday, having been detained for nearly two years in Turkey. Some analysts also charge that Turkey has used Brunson’s release strategically to take advantage of Khashoggi’s case, which dealt a blow to U.S.-Saudi relations and provided an opportunity for Turkish President Recep Tayyip Erdogan to emerge as a powerful figure in the region against Saudi Crown Prince Mohammed bin Salman. There were also speculations that the U.S. might have secured the release of Brunson in exchange for a deal to gain custody of Gulen. U.S. President Donald Trump, however, dismissed those speculations and said Brunson’s release had nothing to do with Khashoggi’s case. He said no deal of any kind was made with Turkey. Trump said it was the result of pressure on Turkey. “The timing is a strict coincidence,” the president told reporters during a meeting with Brunson in the Oval Office shortly after his release. “The only deal, if you could call it a deal, is a psychological one. We feel much different about Turkey today than we did yesterday,” Trump added at the time. Some analysts also warn the U.S. may be enticed by the results of pressure on Turkey and allow that approach to shape U.S.-Turkey relations going forward. “There is a real potentially sort of dangerous dynamic taking shape here whereby the U.S. sees that the stick approach worked, a pressure campaign worked,” Max Hoffman, a Turkey expert at the Center for American Progress, told VOA. “They saw the pressure got their guy [Brunson] out of prison and they will be tempted to go back to that approach,” Hoffman added. Brunson was among tens of thousands of people Erdogan detained on similar terror charges during the state of emergency he declared following the failed coup. Many foreigners, including American citizens, were among those arrested.